Visit the Abbey of St. Andrew in Flumine is like taking a trip back in time: along its corridors and its rooms, you will find yourself immersed in an ancient atmosphere, charming, some ‘mysterious. Looking around it is not difficult to imagine the Benedictine Monks who came to this territory in the VIII century, intent on carrying out their daily activities of prayer and work. Inside the Abbey, the splendid church founded in the VI century by Galla, daughter of Symmachus (the nobleman killed by order of Theodoric of which he was counselor), welcomes the visitor with a solemnity, offering his view of the precious frescoes, granite columns and half columns with Ionic and Corinthian capitals and the floor cosmatesque. 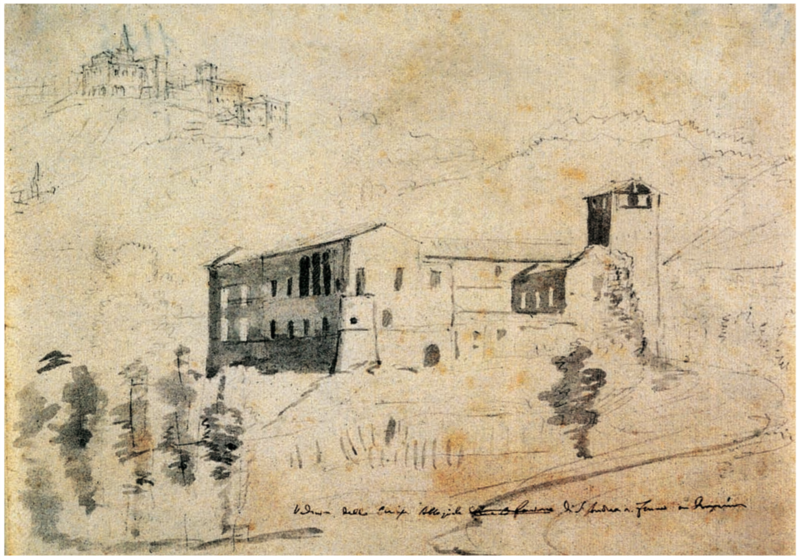 The origin of the Abbey of Sant’Andrea in Flumine is uncertain. The monastery was built in the VIII century by Carloman, brother of Pepin the Short and the 747, monaco Soratte. Both the Abbey and the church, in fact, stand on the ruins of the Roman legacy. Originally dedicated to Saints Peter, Benedict and Andrew, the monastery has preserved only the name of ‘St. Andrew’. The name ‘in Flumine’ is a clear reference to the topographic nearby Tiber. The strategic location and proximity to the river port of this abbey made a very important hub for the control of traffic and the ferry service linking the area with the city of Rome. In the IX century, St. Andrew was one of the imperial monasteries, together with S. Maria of Farfa, S. Salvatore of Rieti and the monasteries of Monte Cassino, and S. Sylvester the Soratte. In the X century, the Abbey was built around a fortified wall that you can now see only a tower (originally there were three), transformed in ages and then altered the church tower. After a long period of relative decline, in 1958 took place the first restoration of the church. Subsequent rehabilitation and restoration works have focused on the first tower and then the whole building. Image from ‘Il complesso monumentale di Sant’Andrea in flumine presso Ponzano Romano’ written by Stefania Cancellieri Architect (Gangemi Editore). The church, consecrated, that is in the abbey is in the Romanesque style. Inside are real works of art, like the beautiful mosaics Cosmatesque, the tabernacle built in the XII century by the master Nicholas with his sons John and Guittone and various frescoes dating from the VIII-IX and XV-XVI. Important to note the presence of a rare example of jubè, the special structure very common in the abbey church, which served to separate the sanctuary, used by the religious, from the nave occupied by the faithful. The long series of restorations of the Abbey of St. Andrew in Flumine culminated in the intervention made by the Superintendency for Architectural and Landscape Heritage of Lazio for the celebrations of the Jubilee of 2000. Regarding in particular the Abbey, was made a general consolidation work, new windows were inserted, have been restored and made new perfectly viable environments on the ground floor, and was recovered the ancient covered course. In addition, it has been valued the important archaeological site. Instead the church has undergone a adaptation of the systems. Thanks to these interventions was possible, among other things, improve the structure of the complex, complete functional recovery of the former convent and to complete the museum display of archaeological remains (with the invaluable contribution of the Archaeological Superintendence of Southern Etruria). The latter is of particular interest because the excavations made in the square in front of the monastery have unearthed many relics of the history of St. Andrew in Flumine and the surrounding territory, as the marble bust, the piece of capital and the fragment of frieze recovered during the first archaeological artifacts from the distant 1835. One more reason, one of many, to visit this historic Abbey. Today, thanks to Mr. Giovanni Bonci, who oversaw the final stages of restoration also taking care of maintenance and upkeep of the complex, the Abbey is the seat of the International Institute of Communication Onlus (http://www.inincomm.com) , training organization that promotes cultural activities in the area.